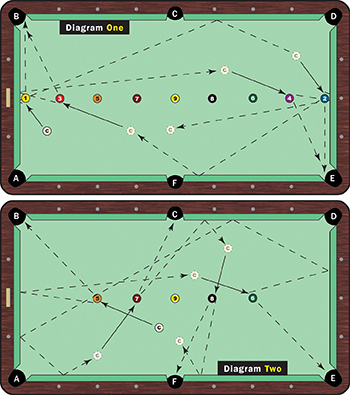 Here is a drill that combines cue ball control and creativity. The best and most challenging practice drills are the ones that best emulate true game situations. They are the drills for which there is no single way to complete them. They require different strokes, decision-making and, occasionally, they force you to come with a big shot. This is such a drill. It is a 9-ball pattern drill that uses all six pockets and all six rails, making it the ultimate cue ball control and pattern selection test. Practice this drill and you will get an excellent feel for the rails and for solid position play. And in those instances in which you get a little out of line, the drill forces you to be creative and use your shot-making skills to get back in line. Set the balls up as shown in the diagram. The cue ball must hit at least one rail on each shot, but the cue ball can�t touch any of the other balls on the table. Again, there is no set way to complete this drill, in large part because if the cue ball rolls longer or shorter than you want, your recovery will require some creativity. When I do this drill (Diagram One), I use a touch of inside English from the 1 to the 2, sending the cue ball off the bottom rail and the side rail just above the side pocket (C). I use the same approach from the 2 to the 3. From the 3, I will once again go one-rail for the 4 in pocket E, using a touch of inside English and a little follow. The same approach will be used going from the 4 to the 5, inside English with a touch of follow. The 5 (Diagram Two) is a simple one-rail shot back up table for the 6. The big shots are on the 6, 7 and 8. There are multiple ways to get shape on the 7 into pocket C. You can use a touch of inside English and go two rails, or you can use high, left and use four rails for shape on the 7. In this case, I went four rails. Your approach to the 8 ball in the opposite side pocket (F) will then depend on the angle you�ve left yourself. Finally, try to get shape for the 9 in pocket C.
Unless your cue ball control is perfect, you will probably need one or two big shots to complete this drill, which is what makes it such a challenging, but fun exercise. This is a great drill for all levels of play, although it might take a few tries for an amateur to complete. The key is to improve each time you try the drill. It is a great way to chart your improvement and progress. Again, this is a perfect way to develop feel for the rails and to develop creativity. Having all six pockets and all six rails at your disposal makes it interesting, too. Those instances in which you suddenly have to go three or four rails for position will really test you, but, then again, the ability to recover and get back into line is what makes the great players great. Emulate them in this drill and take your game to another level. Don�t be afraid to move the cue ball around and use different strokes.